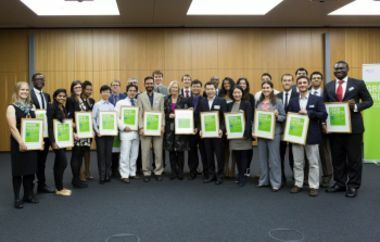 On 7 November 2014, the German Federal Minister of Education and Research Professor Johanna Wanka honoured the winners of the Green Talents Competition 2014 during a festive ceremony in the new ministry building in Berlin. In her speech of commendation, she stressed the importance of the initiative for future international science cooperation. "I note with great pleasure that over the years there has not only been a steady increase in the number of prize-winners but also in the amount of attention received and the international renown of the Green Talents programme. In the meantime, this award is an internationally recognized prize for young researchers in the field of sustainability research. The global sustainability goals can only be achieved through scientific cooperation and the exchange of knowledge. This calls for personal meetings between young scientists across national borders. 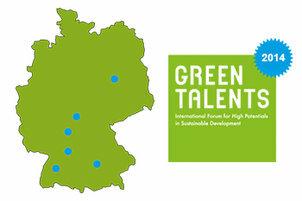 Therefore, I warmly welcome this year's Green Talents in Germany." 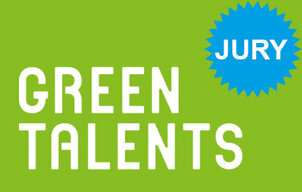 A high-ranking jury of experts selected 25 ‘green’ visionaries out of over 800 applicants from more than 100 countries as "Green Talents 2014". This prestigious title was awarded for the sixth time under the patronage of the minister to some of tomorrow’s leading scientists in the field of sustainable development. 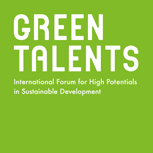 The Green Talents - International Forum for High-Potentials in Sustainable Development 2014 took place from 26 October (day of arrival) to 10 November (day of departure). Have a look at where we have been in 2014... more: Science Forum 2014. The winners were selected by a jury of renowned German experts, whose members in 2014 included Dr Busch, Professor Jessel, Professor Schneidewind and Professor Weiger. more: Jury 2014. 25 young researchers from around the world have won the "Green Talents 2014 - International Forum for High Potentials in Sustainable Development" Competition of the German Federal Ministry of Education and Research (BMBF). Here you can find a short profile of all awardees 2014. more: Awardees 2014.